Suzan DelBene is a Democratic member of the United States House of Representatives, representing the 1st district of Washington, since 2012. DelBene is a former Microsoft Executive and an independent entrepeneur. 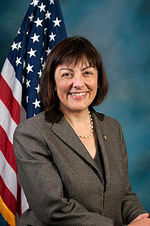 Suzan DelBene was born in Selma, Alabama. She was the fifth child in her family. She has lived in Washington for most of her life. At a young age her family moved to Newport Hills, now Newcastle, WA. They later moved to Mercer Island. In a recent biographical video, DelBene described her family's trouble "paying bills" and the hardship they faced after her father, a long time airline pilot, lost his job. The Council for a Livable World, founded in 1962 by long-time socialist activist and alleged Soviet agent, Leo Szilard, is a non-profit advocacy organization that seeks to "reduce the danger of nuclear weapons and increase national security", primarily through supporting progressive, congressional candidates who support their policies. The Council supported Suzan DelBene (D-WA) in her 2010 Congressional election campaign. September 13, 2017 Press Release Washington, D.C. – Today, Congressman Darren Soto announced that he will serve in a leadership role in the House Democratic Caucus Jobs for America Task Force, a unified effort from the House Democratic Caucus to craft a real legislative agenda that will benefit hardworking Americans and middle-class families. The congressman will serve as co-chair for the New Economy Task Force, along with Representatives Suzan DelBene (D-WA), Debbie Dingell (D-MI), and Raja Krishnamoorthi (D-IL). She is a strong supporter of President Obama’s vision of a nuclear weapons free world. She also opposed the invasion of Iraq and supports vigorous pursuit of a negotiated solution to the diplomatic stand-off with Iran. DelBene’s Republican opponent is John Koster, a former State Representative. Koster is an ardent supporter of a strong military. He is also a supporter of Rep. Paul Ryan’s (R-WI) budget plan, which funds a military buildup through cuts in social programs. DelBene proved her skills on the campaign trail when she nearly defeated Rep. Dave Reichert in Washington’s 8th Congressional District in 2010 despite the Republican wave that year. The 1st district has been represented since 1998 by Democratic Rep. Jay Inslee, who resigned to run for Governor this year. DelBene believes her chances are better running for an open seat in a Democratic district than against Reichert, an entrenched incumbent. United States Representatives Suzan DelBene (D-WA) and Mark Takano (D-CA) also addressed the reception audience. June 18, Rep. Justin Amash (R-MI), Chairman of the House Liberty Caucus, and Rep. John Conyers, Jr. (D-MI), the Ranking Member on the House Judiciary Committee, announced the introduction of bipartisan legislation to address National Security Agency surveillance. JStreet endorsed her again 2016. The Alliance for Retired Americans endorsed Suzan DelBene in 2012. The Alliance for Retired Americans Political Action Fund endorsed Suzan DelBene in 2014. In 2014 Progressive Democrats of America assigned activists to deliver their material to almost every US Congressman and Senator, Martin Chaney, was assigned as the contact for Rep. DelBene. In June it was Jonnee Denton. Representative Suzan DelBene was part of President Barack Obama's March 2016 delegation to Cuba. This page was last modified on 13 February 2018, at 05:31.